Traveler at Sea: We are so cheap! We're on a mission. Our mission is to wring as much use out of reciprocal moorage agreements and the Washington state marine park pass as humanly possible. Giving up our 500 dollar Swantown slip, we untied the lines and decided to just float around for three and a half months. We'll save $1750, I thought. Today, dockside at the Poulsbo Yacht Club reciprocal dock, I've taken out the log, cracked open the spreadsheet, and done the calculations. It's definitely break-even time! In this first month we have more than paid for our yacht club memberships at the South Sound Sailing Society and the Washington Yacht club. My tally shows 11 nights of free reciprocal moorage with a savings of $325. As for the state parks, we've stayed seven nights thus far this season, recouping the yearly pass fee of $210. From here on out, it's all gravy baby! Here's our track and backtrack...in central Puget Sound. It's about time we left the central Puget Sound cruising grounds. We've worn out our welcome, used up our reciprocal privileges, and exhausted our meager supply of friends who able to join us on the boat. At noon today we tucked up right inside the breakwater here in Poulsbo, grabbing 44 feet of reciprocal space at the PYC. As it was time for re-provisioning, we hiked to town, checked out the viking hats, got directions from a nice lady at the waterfront, and started to plod up the hill towards the grocery store. Lo and behold, a car pulled over and it was Loren and her dog Hart, who we just met on the waterfront. "Get in here. I'll give you a ride." Sweet Ms. Loren carried us to the Central Market where we had a wonderful time sampling fruit and tasting wine. We found organic fruits and vegetables, fancy sausages, and ground lamb - all at astronomical prices, but who cares? Now we are sitting here fat and sassy, a southerly blowing us off the dock, with free internet to boot. So here's the deal about our summer. We are cruising old Traveler further and further north as the weather warms. Goal number one is to see new places. Goal number two is for Connie to play music wherever we find a pub, wine bar, or yacht club with a corner to play in. Goal number three is to do all this while avoiding spending any Loonies or Toonies on dock space. Our itinerary has to be totally flexible so as to attain all three goals. After Kingston we'll most likely head around the corner and out into the Strait of Juan de Fuca. There we hope to cash in on the reciprocal at the John Wayne Marina in Sequim Bay and also the state park float there. 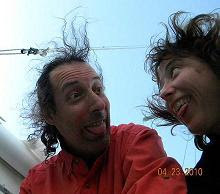 We hope to connect with the Dekkers in east Port Angeles before sailing across the Strait to the San Juans where Connie has a gig at Vita's Wildly Delicious on Lopez Island. I'm hoping to get a free dinner out of it. We've got eleven state parks in the San Juans to visit so as to get the most benefit from our parks pass and a couple of reciprocal moorages to take advantage of there but I bet we'll be wanting to get into Canada to take advantage of our new Canada fishing license. Let's see, $110 for the license, $200 worth of crab and shrimp traps... It's gonna take me quite a few pounds of harvest to break even on that deal. Great post! What a life! Love to you and Connie! Let me know when you're going to be back down here and I'll get Connie into Dillinger's!! Scott, This is Brian Johnson (Julie Howe's) friend. I have been following your blog for a few years now and would love to meet you sometime. I just spoke with Julie and understand you are up north on the water. 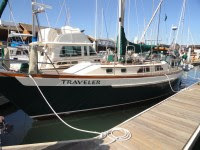 I am just getting back from a 2 year road trip in South America and am planing to transition to a boat. What is your contact info ?